You’ll find a world of things to do at Westminster Village Muncie. You may choose to attend a cultural event at the University or visit one of the nearby restaurants or shopping areas. In addition to Meijer and Walmart, the new Concannon’s Bakery, Cafe and Coffee Bar, American Health Network, Family Vision Care and the YMCA are all located in our neighborhood. 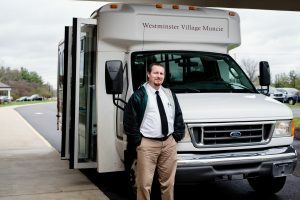 Although you can use your own automobile as you wish, many residents enjoy the convenience of door-to-door service provided by the Village bus. 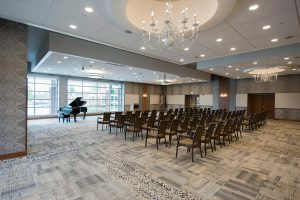 Without setting one foot outside, you can enjoy a movie or attend a variety of entertainment programs. Bible study group, interfaith vesper services and several private religious opportunities may be selected to fulfill your spiritual needs. You can “Bring, Browse or Buy” at the Next-to-New shop, a second hand store run by one of our Residents’ Association Committees. The beautifully landscaped rural grounds and pond offer a close up view of nature at its finest. Gardening, lectures, crafts and games are all planned for your enjoyment. Your new lifestyle can be as full or as free as you choose!